WORK on the repaving of the Market Place speeded up during the second week of January - but not by much. “The pace of work seems to be very slow and questions need to be asked why so few people have been employed to do this work,” said Steve Dancey. This phase of work is running along the northern side of the street and will see vehicles prevented from parking there for the first time in the town’s history. 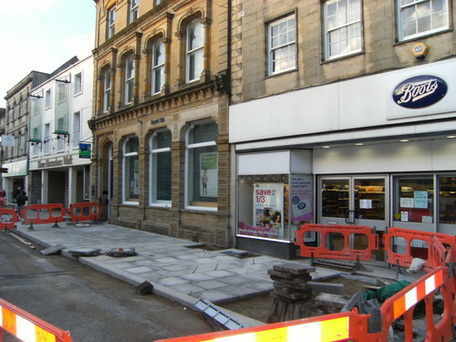 The work will no doubt improve the look of the street but will there be any businesses left? This plan was likely to have a devastating impact on the town centre even when the economy was enjoying the 'Brown Boom' but now that it has well and truly crashed the impact could be unimaginable. Pictured: The work progresses slowly along the norther side of the Market Place. In two weeks it had edged past Lloyds Bank and reached the entrance to Boots.